Home » Becky Sharp. Vanity Fair by William Makepeace Thackeray. … IN the midst of the great persons assembled and the eye-glasses directed to her, Rebecca seemed to be as cool and collected as when she used to marshall Miss Pinkerton’ s little girls to church. Numbers of the men she knew already and the dandies thronged around her. As for the ladies, it was whispered among them that Rawdon had run away with her from out of a . convent, and that she was a relation of the Montmorency family. She spoke French so perfectly that there might be some truth in this report, and it was agreed that her manners were fine and her air distingue. Fifty would-be partners thronged round her at once and begged to have the honor to dance with her. 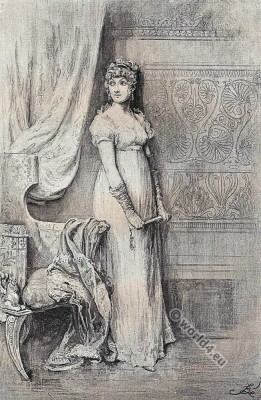 Thackeray’s “Vanity Fair.” Frederick Barnard, Artist. William Makepeace Thackeray 1811 – 1863 was an English writer and is next to Charles Dickens and George Eliot as the most important English-language novelist of the Victorian era. Vanity Fair or, a Novel Without a Hero, 1847/1848 published in installments in London’s satirical magazine “Punch”; is an important work by the English writer William Makepeace Thackeray, who is next to Charles Dickens as the most significant representatives of literature of the Victorian age. The Society novel offers a multi-faceted, all social classes enclosing image of London society at the beginning of the 19th century and is characterized by his ironic style and his precise view of the acting characters and their characters. Thackeray’s novel is set in the time before the Victorian and pre-industrial England, the outer framework of action form the wars of liberation of the European states against France and its ruler Napoleon and the subsequent two decades. The victory of the coalition armies over Napoleon at the Battle of Waterloo in 1815 is the central turning point of the epic work.